Those medals may be a little too over-sized but they certainly are attractions. 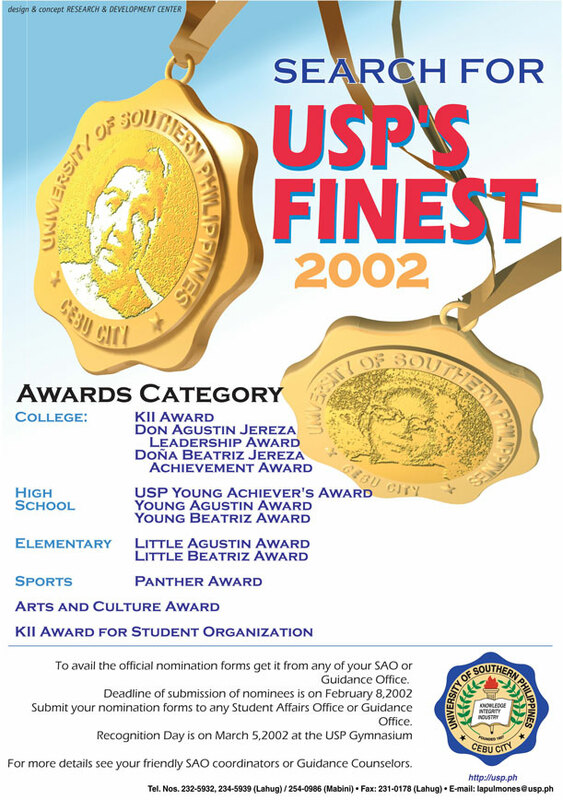 Emblazoned in gold and bearing the portraits of University of Southern Philippines (USP) Founder Don Agustin Jereza and Co-founder Do?a Beatriz Jereza, real special awards for USP’s Finest 2002. The medals were computer-generated images because the real ones were still to be ordered and the poster has to come out early for the eliminations. Poster outputs were laser-printed by Global Village International Learning Center which used to be at 3rd Level, Ayala Center Cebu. Global Village is an educational institution with a sideline business in blank cd / dvd recordables, computer peripherals, software, and laser printing. In Cebu City, they are the number one supplier of generic and branded CD-Rs, DVD-Rs, CD-RWs and DVD-RWs. Now back to the medals. We also designed the different medals that were awarded to finalists under different categories.